A true stalking bug, deadly when trout can be seen lying in clear water. Takes are signalled by the flash of a mouth or by the fish suddenly moving. Wind the thread to a position opposite the barb. Catch in a bunch of Marabou and a couple of lengths of krystal flash. Trim the waste and secure down onto the shank with thread. Create a level body by running the thread to the eye and back down to the position opposite the barb again, finish with the thread at the eye. (Make sure the body does not get too thick). 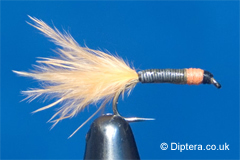 Take some fluo floss and catch in, build up a neat body up to the eye making it level with the lead wire body. Tie off and trim waste. Create a neat head with the thread, whip finish and varnish the head. Cover the lead wire and floss with a thin coat of Epoxy, making sure not to come into contact with the marabou.